Do you know where the Natural Wall is? 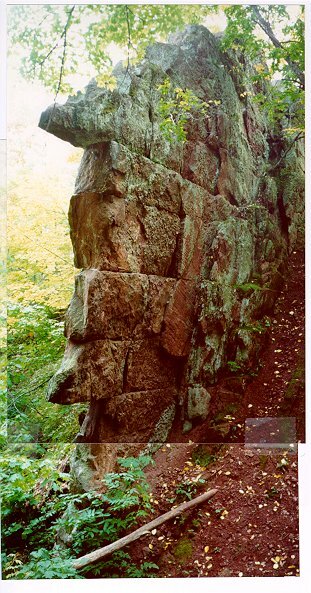 If you have been to the Keweenaw and haven't seen the Natural Wall you are missing out on the greatest natural wonder of the Keweenaw. I will give you a hint: it is not 1/2 mile off the Copper Range mainline. Here are photos of this sandstone wonder, both 100 years ago and today. This is a picture of the Natural Wall taken about 100 years ago. This location is in Jacobsville Sandstone and just east of the Keweenaw Fault. 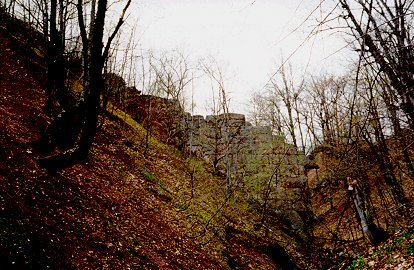 The Natural Wall is a vertical bed of resistant trough-bedded sandstone that forms an erosional wall on the south side of the ravine. The Jacobsville Sandstone in this area consists of conglomerate; sandstone; and shaly horizons, possibly accumulating as the lower portion of the formation dragged along the Keweenaw Fault. The attitudes of beds in the creek bottom change from flat-lying, about 1 km to the east of the fault; to east-dipping; and finally to vertical, and then the beds are folede as the Keweenaw Fault is approached. West of the fault the PLV dip to the WNW at 35-40 degrees. The latest movement on the Keweenaw Fault is reverse, but the fault originated as a major normal growth fault on the southeast margin of the Midcontinent rift system (Cannon and others, 1990). 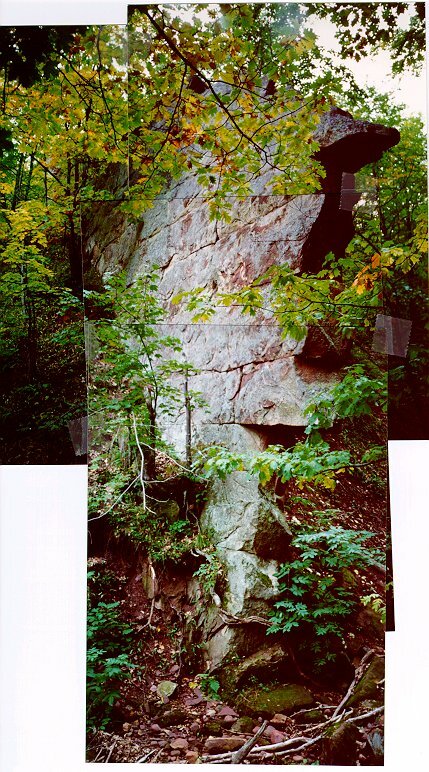 Deposition of the Jacobsville Sandstone was controlled by the same compressional tectonism that produced the Keweenaw Fault. Also at this locality, the Jacobsville Sandstone contains abundant boulder sized clasts of felsic and mafic volcanic rocks, similar to Keweenaw volcanic rocks. 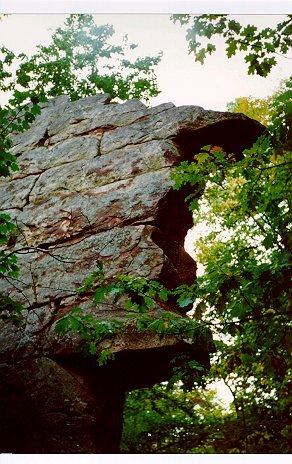 The Keweenaw volcanic rocks were exposed and undergoing erosion during Jacobsville sedimentation as a result of uplift along the Keweenaw Fault.